Innovative and proprietary technique only available at Physiogenex. This method will demonstrate if your compound promotes reverse cholesterol transport and has therefore the potential to prevent cardiovascular diseases. In-house innovative and validated method. In vivo reverse cholesterol transport using 3H-labeled oxidized LDL-cholesterol is the best approach to evaluate compounds affecting HDL metabolism and reverse cholesterol transport. 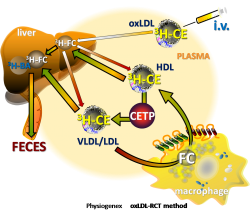 Essential and robust data to demonstrate that your compound promotes the transport of cholesterol from peripheral tissues to the feces and has therefore the potential to prevent atherosclerosis. The ox-LDL method consists in an injection of 3H-cholesteryl oleate labeled/oxidized LDL intravenously. This proprietary method traces the cholesterol metabolism in vivo and may be useful to evaluate drugs affecting reverse cholesterol transport – RCT. Briand F. et al, Arterioscler Thromb Vasc Biol. 2013; 33(1):13-23. Briand F. et al, Circulation. 2011; 124: A11835.